Seen worse, for sure. This story of an over-possessive mother and her stifled son has some glorious moments of remonstration,repartee and rumination between Kajol and that engaging young Bengali actor Ridhi Sen. In this loose and baggy adaptation of a Gujarati play by Aband Gandhi, they play the mother and son with rollicking relish. Sadly the script doesn’t support the Kajol-Ridhi camaraderie beyond a point. And after a solid start the plot crumbles helplessly to the ground writhing down there in sheer helplnessess as an opportunity to pin down a solid film on a mother-son bonding is squandered away in irrelevance, superfluousness and disharmony. Speaking of disharmony, a lot of the film’s aspirational drama originates from music. The songs though not discordant, add nothing to the plot. So what gives, really? The problem in Helicopter Eela is not one of a moral grounding. The statement on paranoid parenting comes across rather strongly through Kajol’s persuasive performance. But I wonder why an actress of her caliber must ‘act’ every second! Her performance is an uninterrupted breathless showcase of her expressions. To watch her make a dozen faces in every sequence is a tiresome exercize after a point. Riddhi Sen as the over-powered son is far more controlled. In a film that often goes for the shrill, Ridhi is pitch-perfect. Tragically there are no other outstanding performances to give the plot that essential push towards a sustained engagingness,. The film is interesting only in spurts. This is a pity, really. A more controlled treatment of the interesting plot would have served director Pradeep Sarkar’s purpose well. 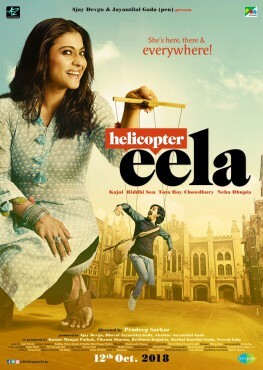 The direction is surprisingly lazy, specially after the mid-point when Kajol’s Mom act is taken kicking and screaming into the college campus. Kajol hardly looks like the mother of a grown-up son. Never known to be a vain actress she is shown to be constantly in full makeup even when her character is at home waiting for the beloved son to return from whatever fun things he does with his life. Another well-known Bengali actor Tota Roy Chowdhary has a deplorably sketchy role as Kajol’s husband. Tota’s character just ups and leaves the plot because—get this—men in his family are known to die young. The same goes for this film which promises to be another Tumhari Sulu (there is Neha Dhupia to remind us of the other film). It finally ends being a half-finished though not entirely unwatchable film. Such a pity. 16 queries in 0.318 seconds.